Because sometimes serious news can be useful, we're happy to inform you search ad network Looksmart, is out with SmartRotation, a cost-per-action (CPA) tool that automatically serves the best-performing ad creative in an ad group based on conversion data from a tracking pixel. The new tool, part of LookSmart's ad rotation, allows advertisers to optimize campaigns by conversion events like sales, sign-ups, downloads, and registrations to drive higher performance. "It doesn't matter how many clicks you have if it doesn't convert", said Michael Schoen, Vice President and General Manager of Advertising Platforms at LookSmart. 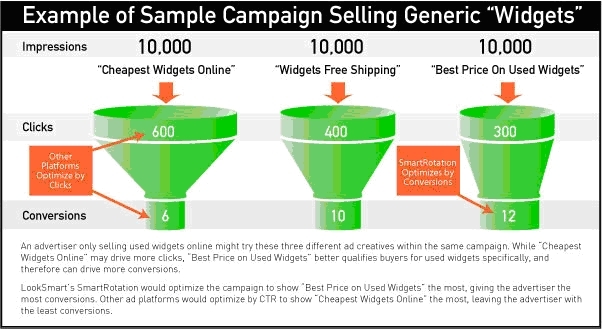 "While other platforms only offer even ad rotation or optimization by click-through rate (CTR), LookSmart's SmartRotation analyzes conversion rates and serves the best-converting ad creative, giving advertisers a better rate of return on their search investment." See? Now don't you think that will make your job a lot easier when your boss asks you which ads are converting the best?